We have a dwarf Orange tree but it has sticky leaves on which drops on the floor as well. We wash the leaves separately with water and a bit off washing up liquid. There are no bugs on them, as we have checked. The plant looks healthy with green leaves and doing well, only we get this sticky substance on the leaves. What is the best product to put on to prevent sticky leaves? 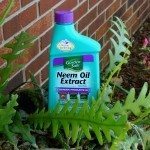 Yes, you can use Neem Oil on your potted Orange Tree.